Greek antiquity has fascinated the British since the Renaissance and inspired numerous scholars , and travelers to visit Greece, from James Stuart and Nicholas Revett who meticulously surveyed ancient monuments and Francis Penrose who studied the Parthenon and Byzantine monuments to Arthur Evans, the driving force behind the Knossos excavation. 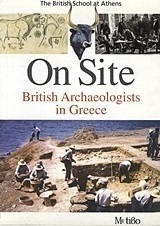 This history of the British School at Athens, with contributions by the archaeologists who have led or worked on a wide range of innovative investigations, offers a unique look at completed and continuing fieldwork in Mediterranean archaeology and the School's significant contributions to the entire field of Hellenic Studies. Γράψε μια αξιολόγηση για το On Site: British Archaeologists in Greece και βοήθησε σημαντικά τους άλλους χρήστες!